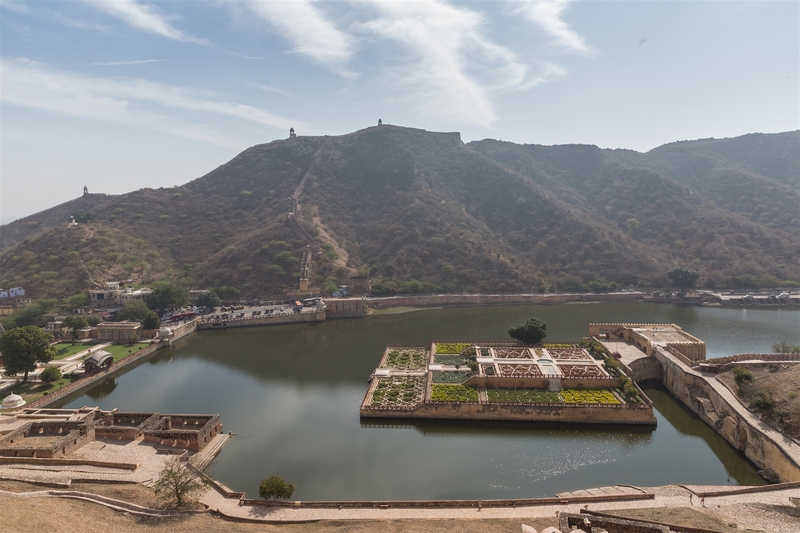 And so to the main event, the No.1 attraction in Jaipur that quite rightly demands the attention of both the discerning traveler and those who merely want to tick the box. 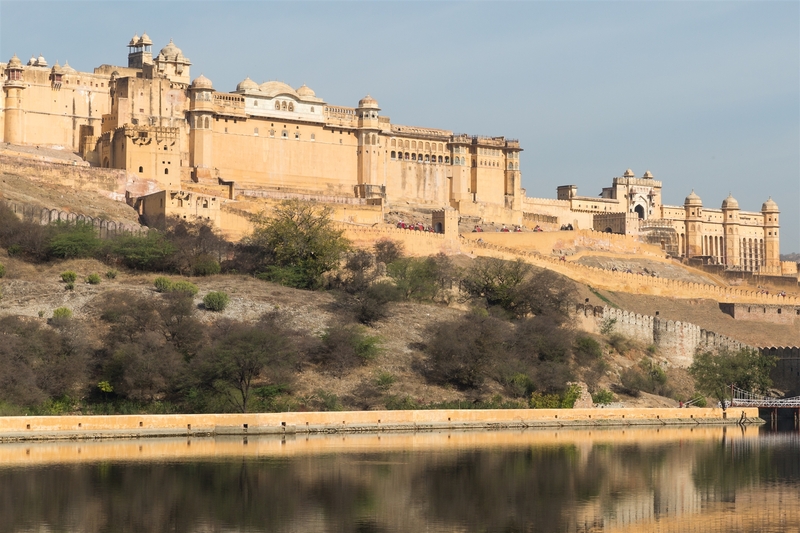 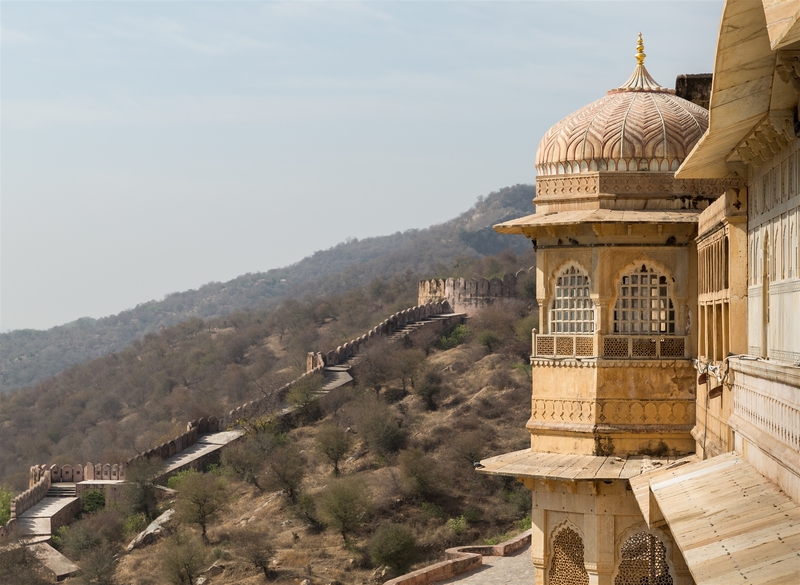 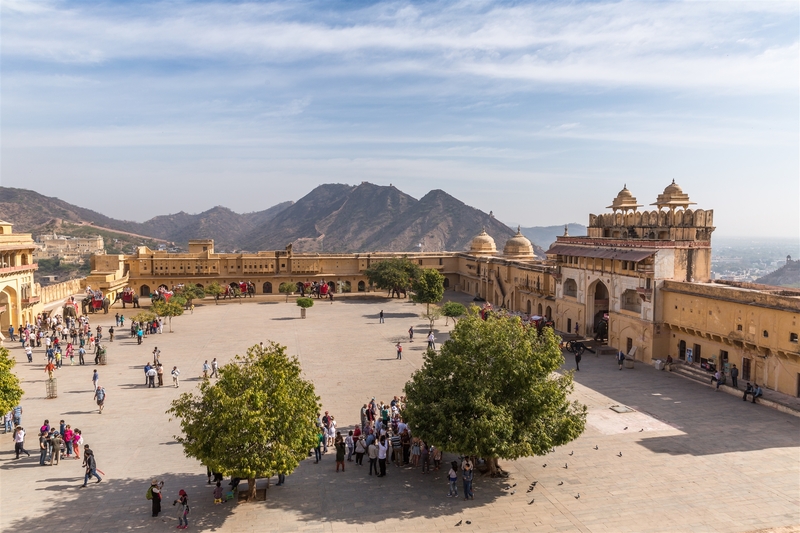 Amer Fort (also known as Amer Palace) is situated just 11 Km from Jaipur, perched on a hill overlooking Maota lake. 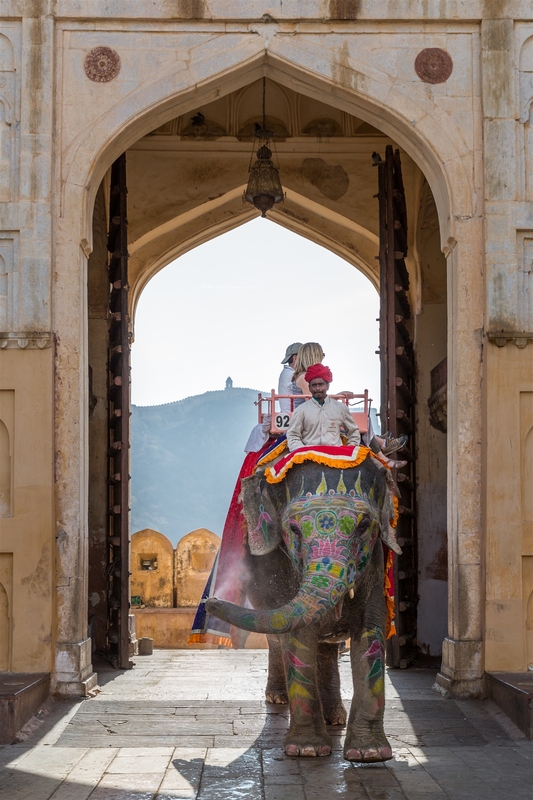 From what I could make out there are two ways to enter the fort; on the back of an elephant donning the obligatory bright red Rajasthani turban, or alternatively there is a road that takes you up the hill to a back entrance of the fort. 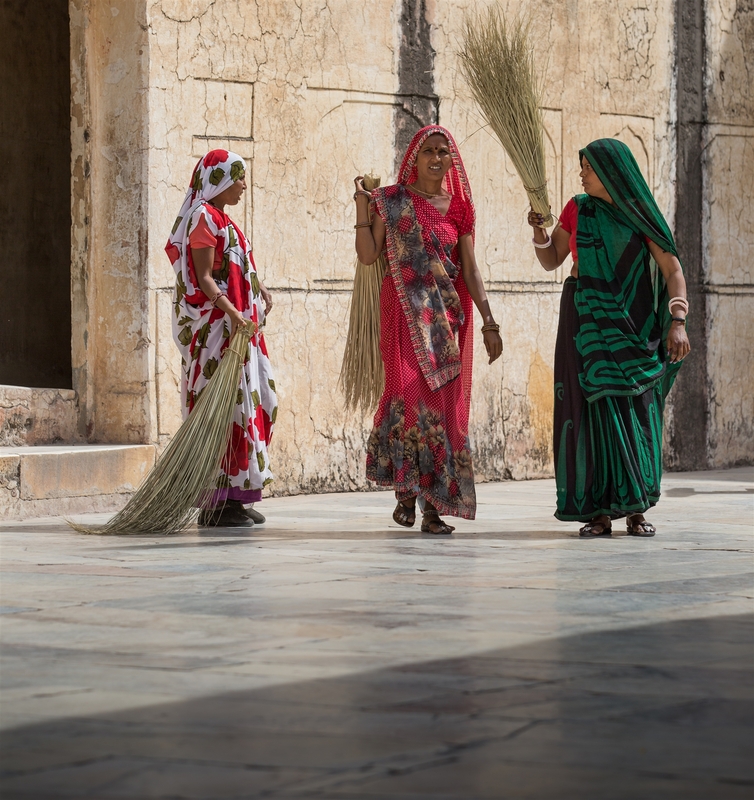 I chose the latter. 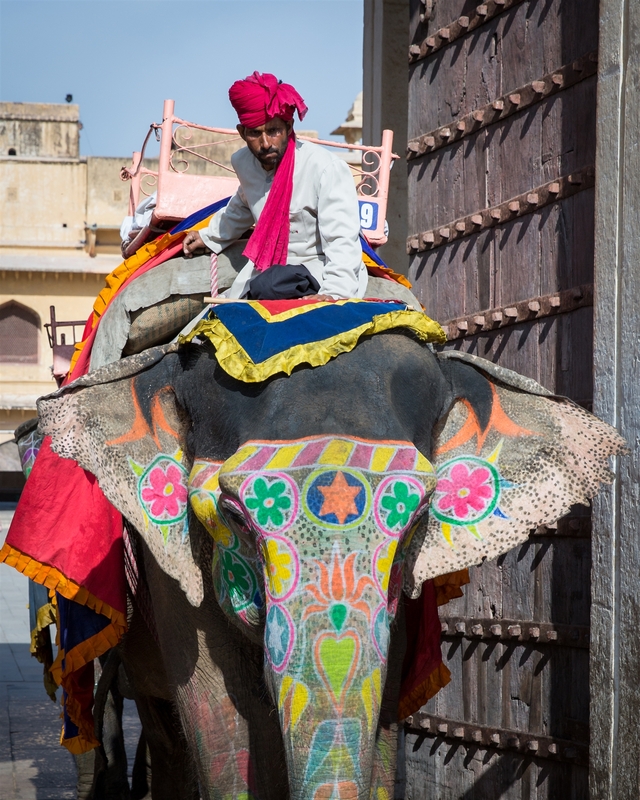 I just felt uncomfortable at the thought of riding an elephant that I suspected did not have a great life, the last thing I wanted to do was support such practices. 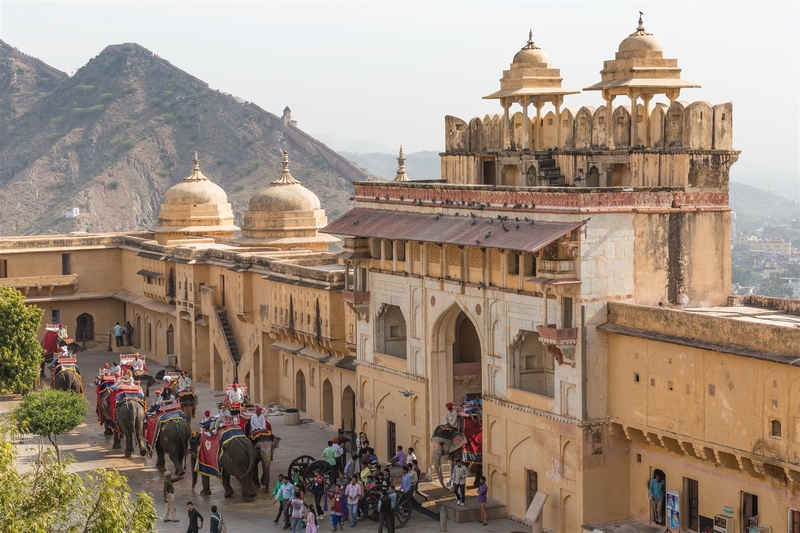 “Grave issues regarding the abuse of elephants and their trafficking has highlighted the inhumane practice of riding elephants up to the Amber palace complex. 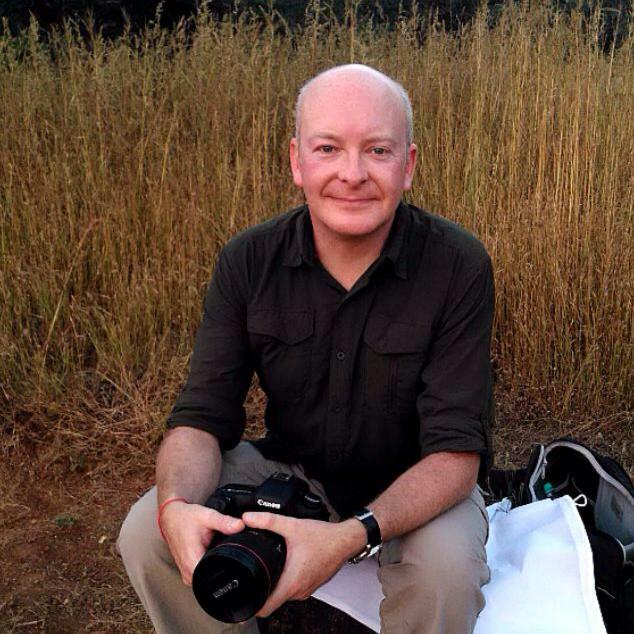 Tourists even face serious threats of diseases at the hands of contact with the elephants and their mahouts. 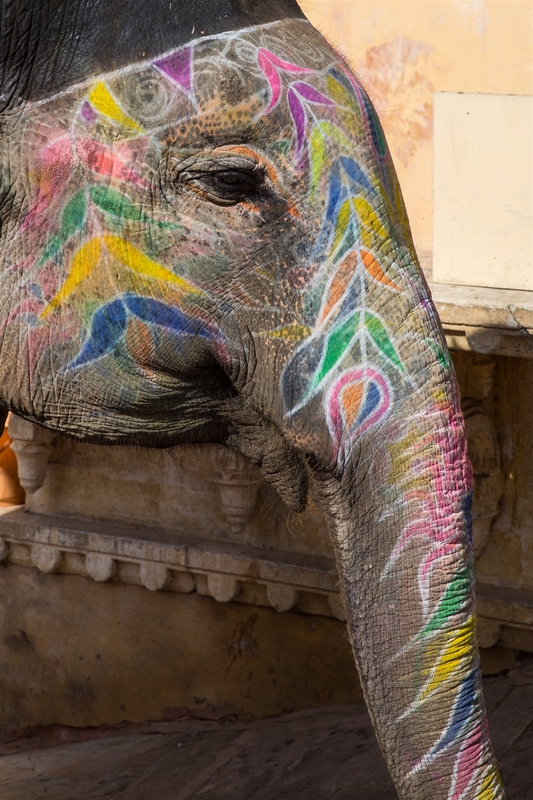 The inhumane practice has been called to be abolished and disenfranchised by tourists – in turn putting a stop to the misery of rented animals. 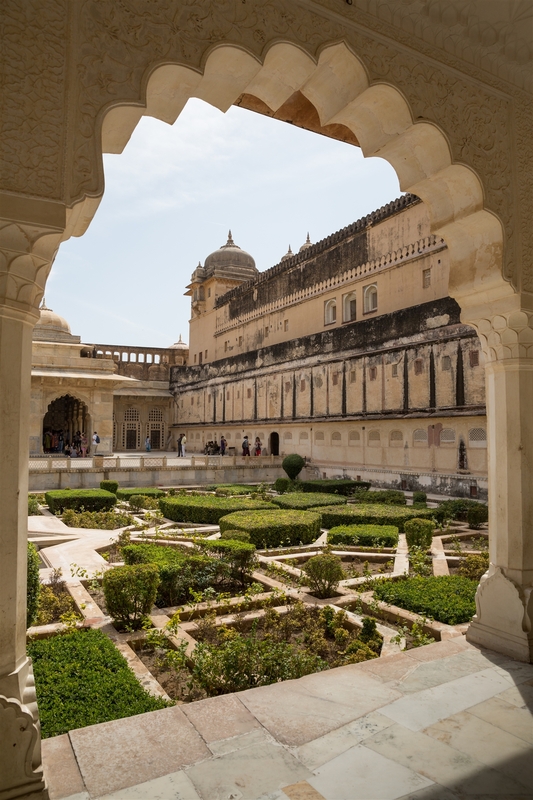 Within the fort walls lies a four level palace layout, each with it’s own courtyard. 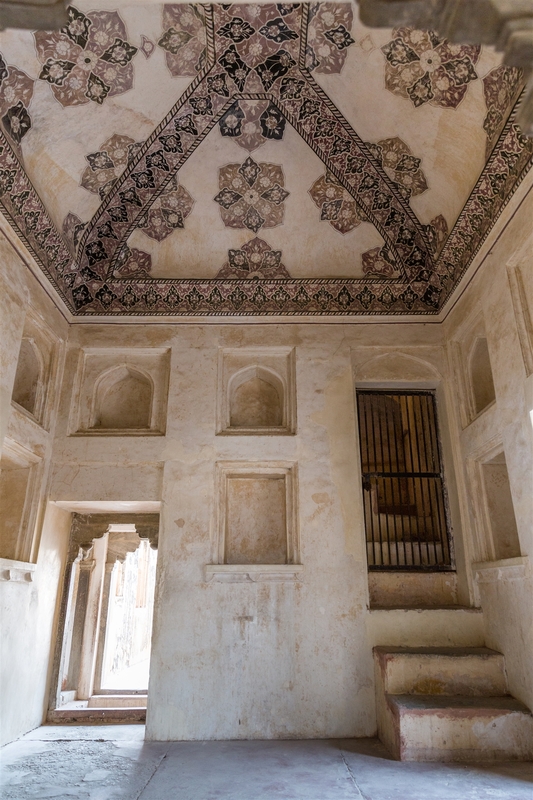 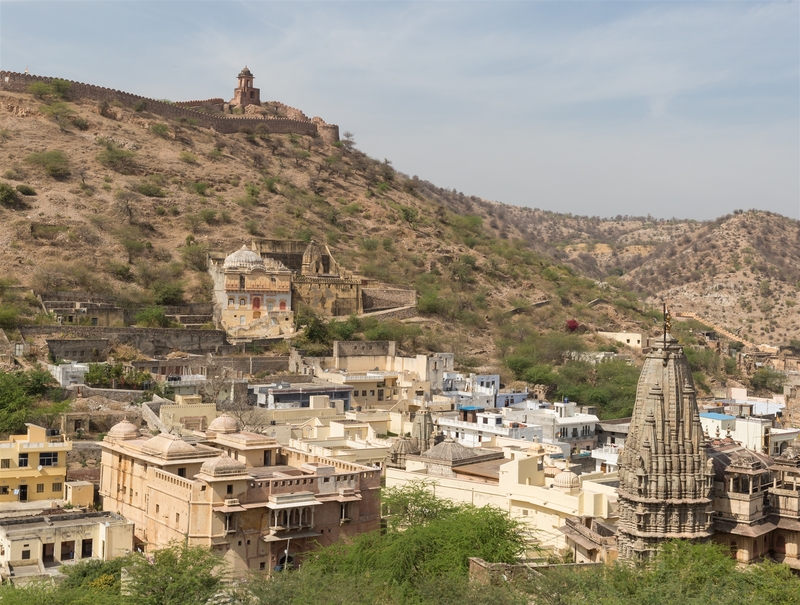 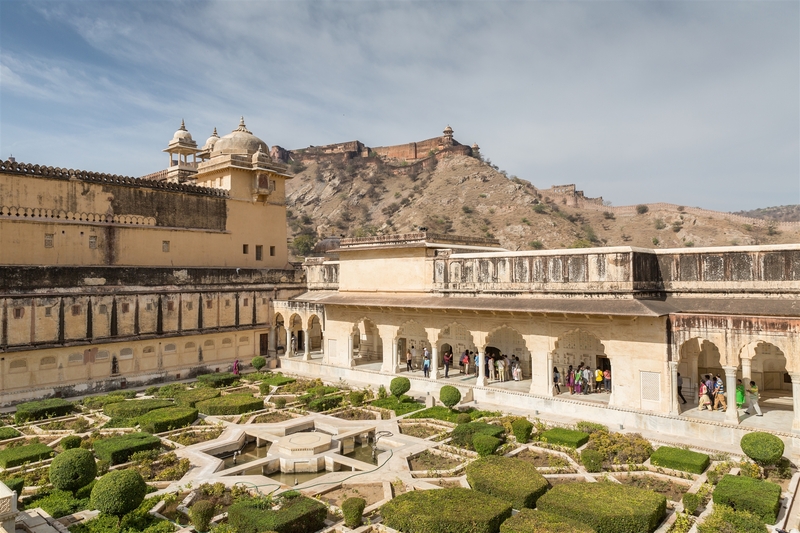 This palace along with Jaigarh Fort, located immediately above on the Cheel ka Teela (Hill of Eagles), is considered as one complex, as the two are well connected by a subterranean passage. 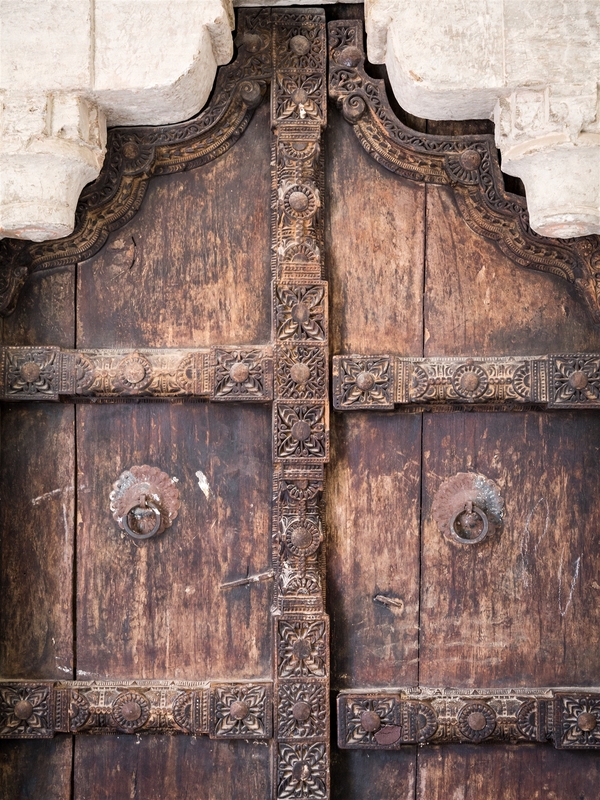 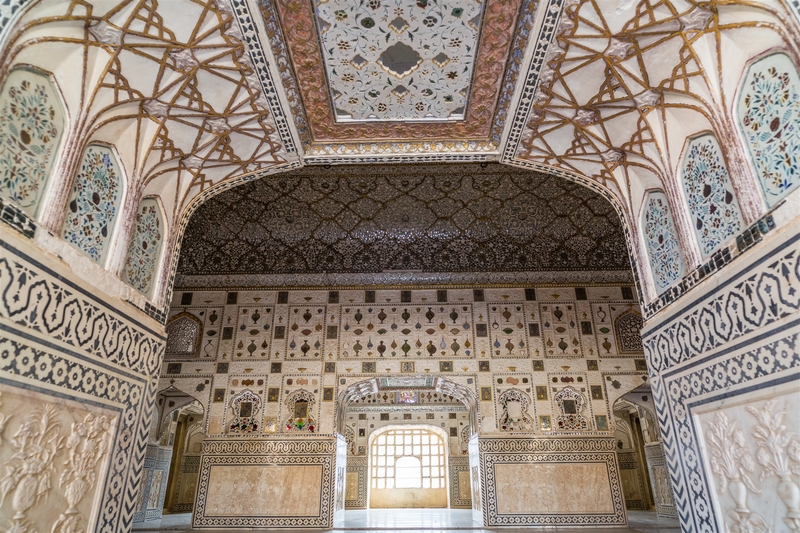 This passage was meant as an escape route in times of war for the royal family members. 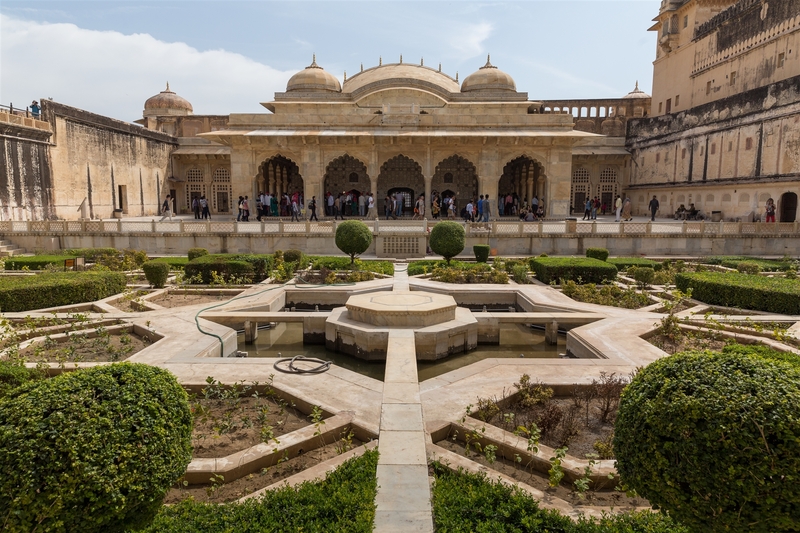 The main entry to the palace (by elephant) is through the Suraj Pole (Sun Gate) which leads to Jaleb Chowk, which is the first main courtyard. 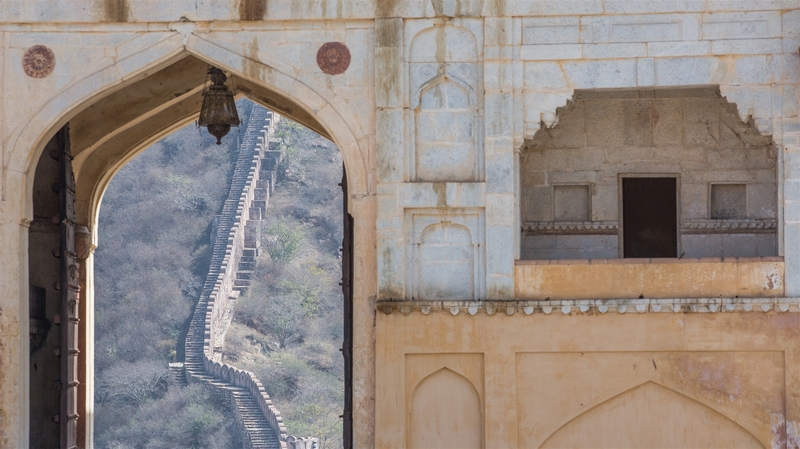 There’s not too much to see here, except for the gate you next need to walk through to explore further – The Ganesh Pol. 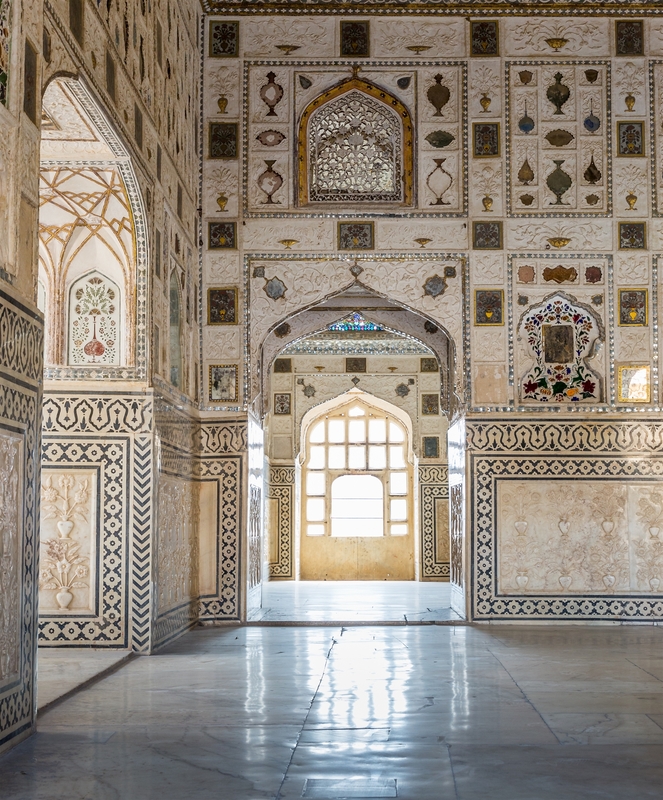 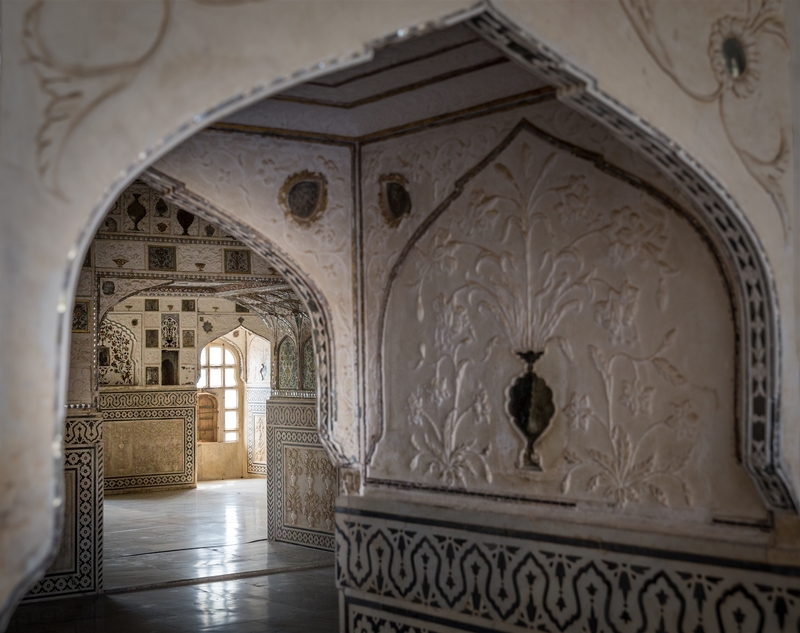 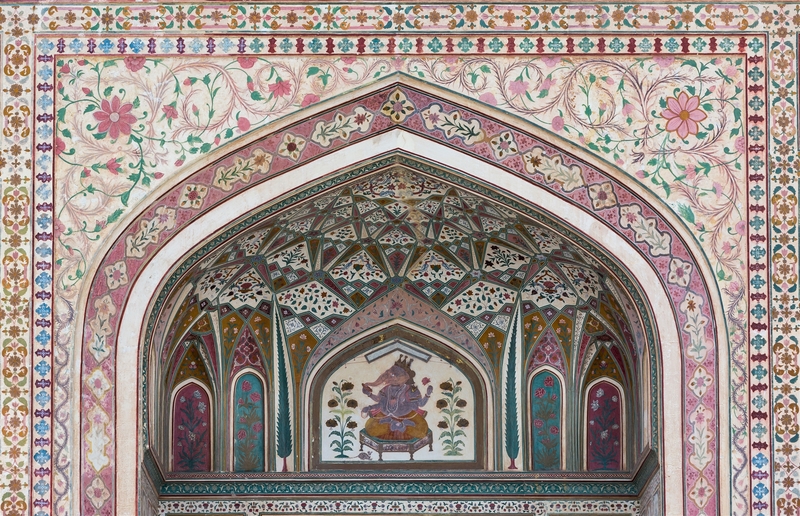 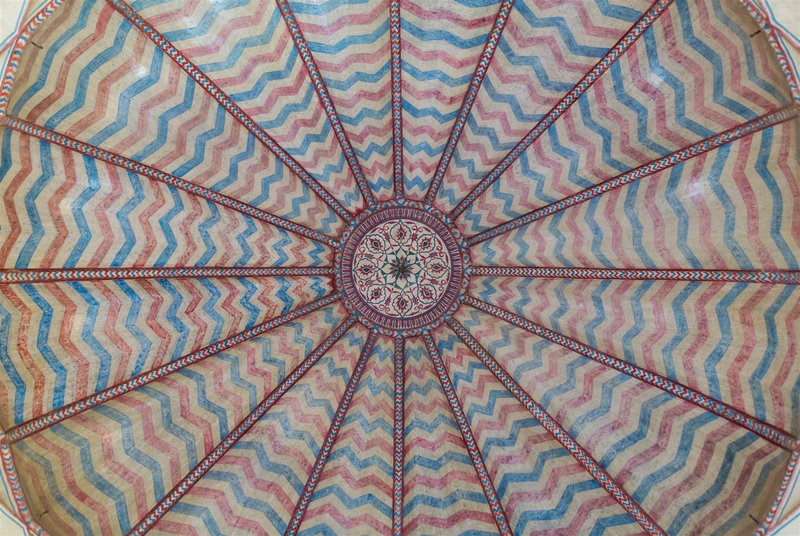 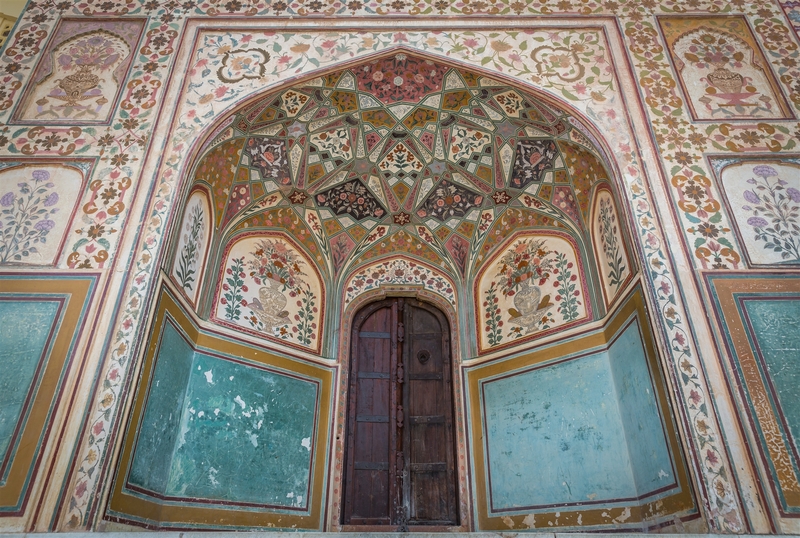 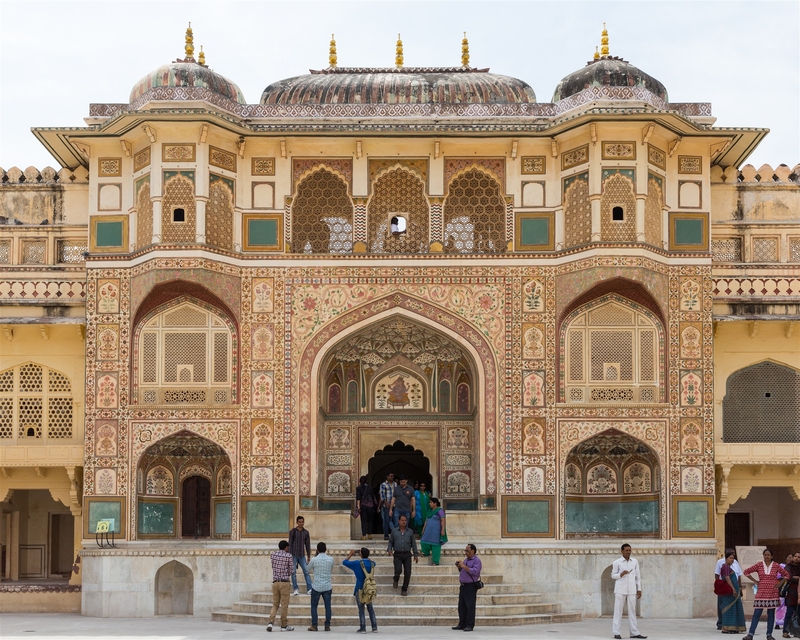 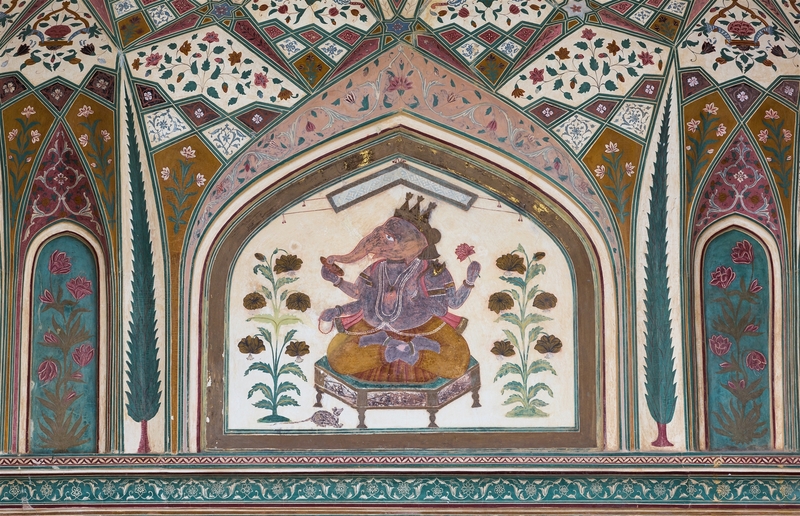 The Ganesh Pol is one of the highlights of a visit to Amer Fort for it’s colourful array of frescoes and tiles which leads to the private quarters of the royal family. 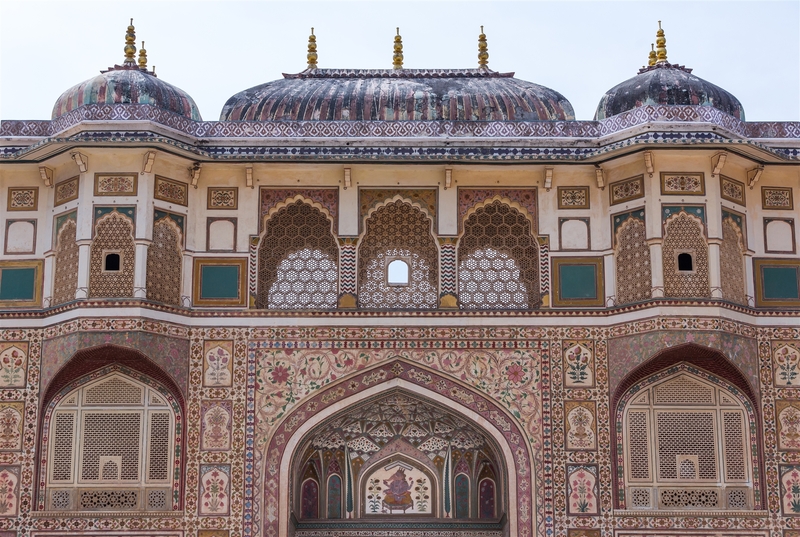 Above the gate is Suhag Mandir, where ladies of the royal family would watch the world go by though latticed windows. 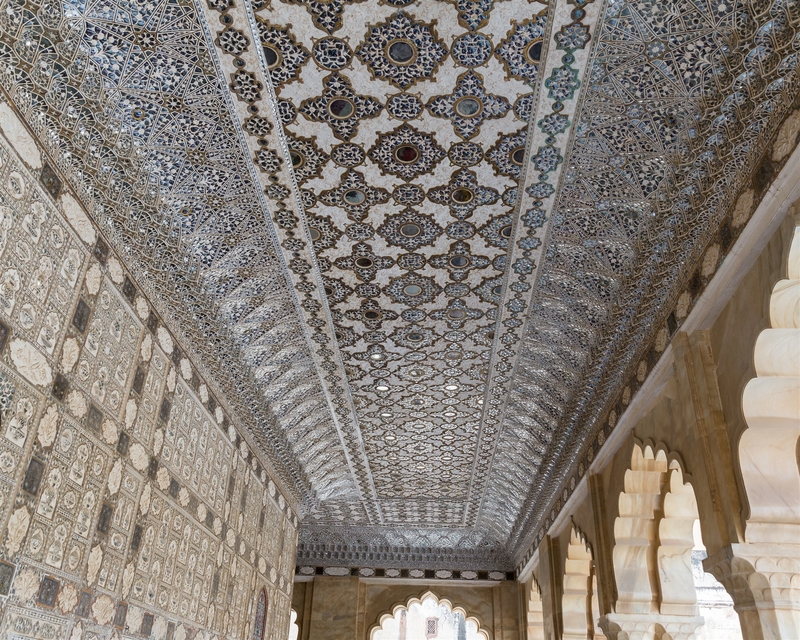 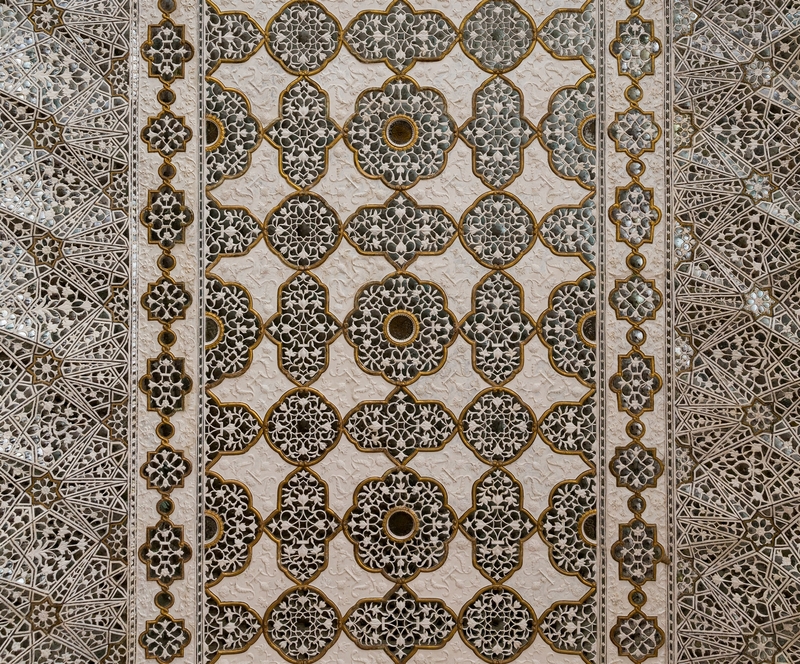 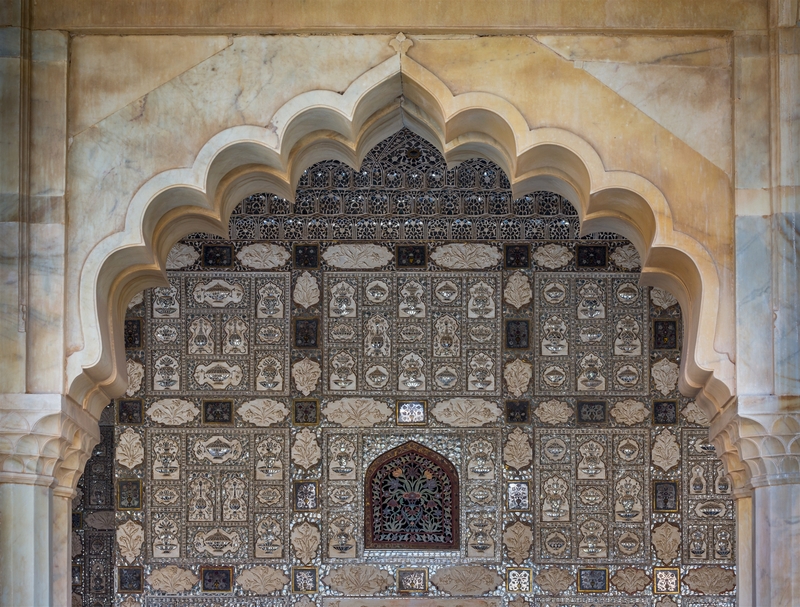 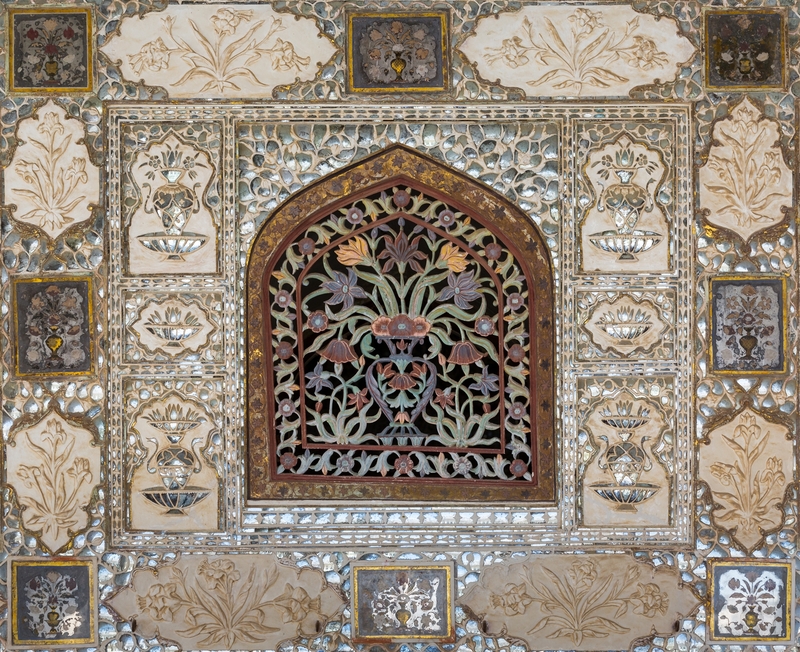 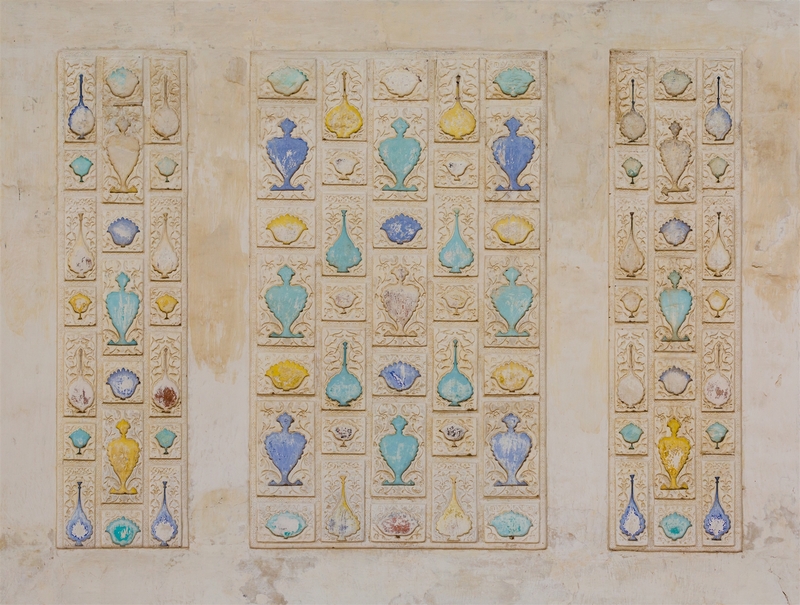 The other highlight of a visit has to be the Sheesh Mahal interior, exquisitely decorated with glass panels and mirrored ceilings. 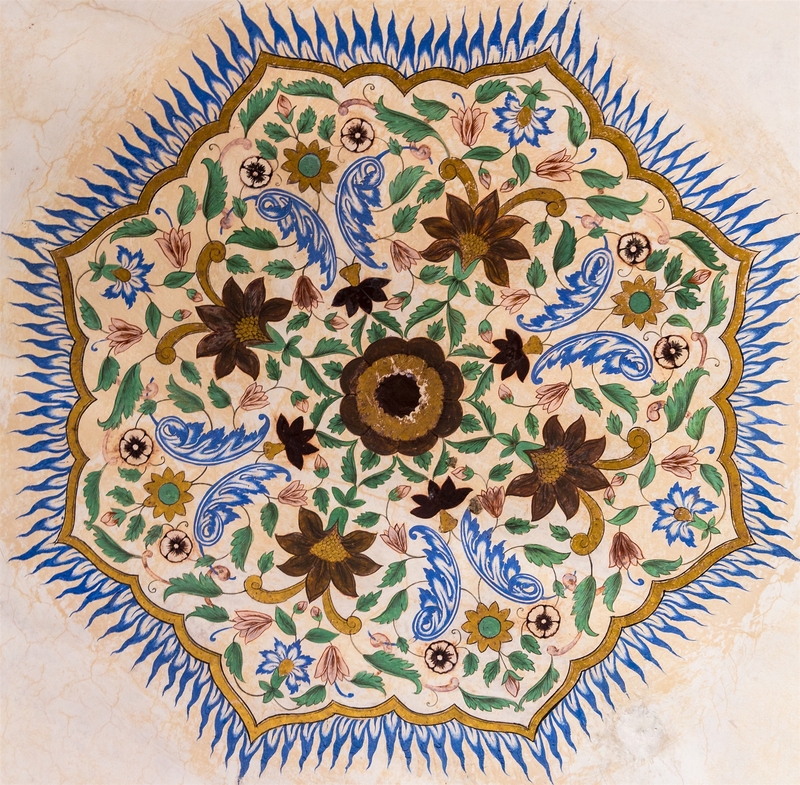 Most of the mirrors are convex and designed with coloured foil and paint. 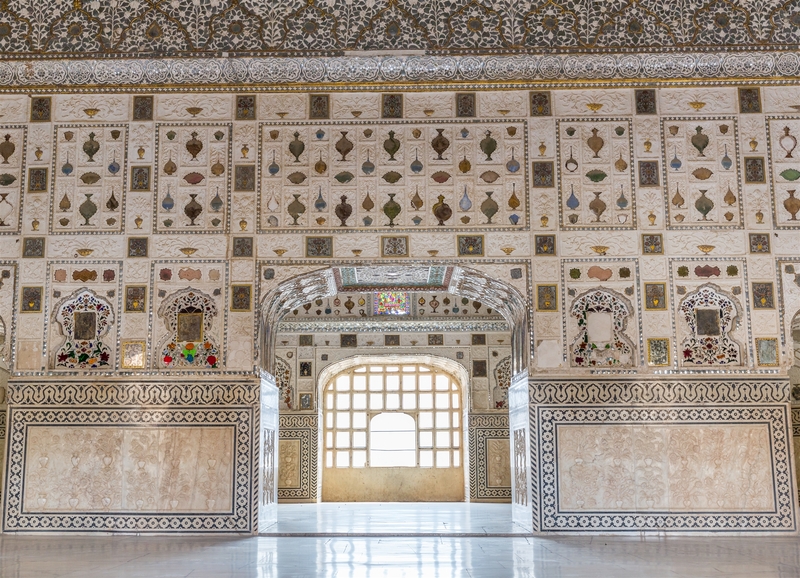 Beyond this lies the oldest part of the palace, a complex array of rooms and narrow passageways which it’s easy to get lost in, and it’s highly recommended you do so. 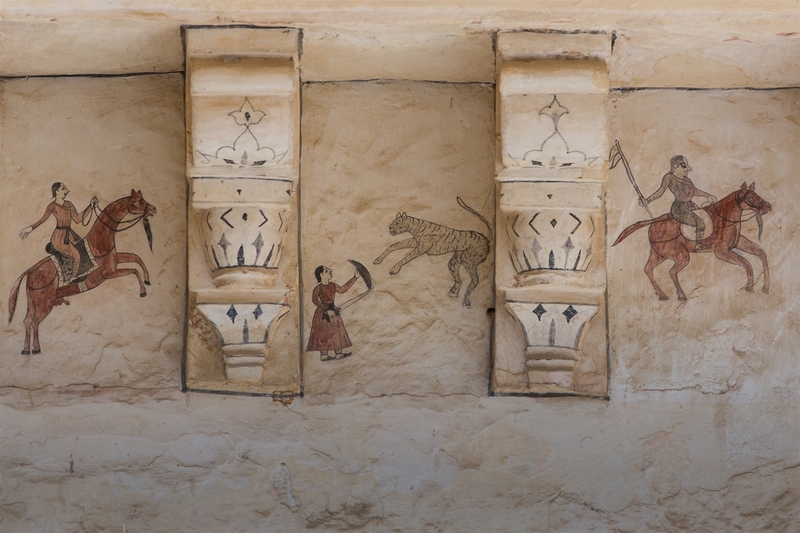 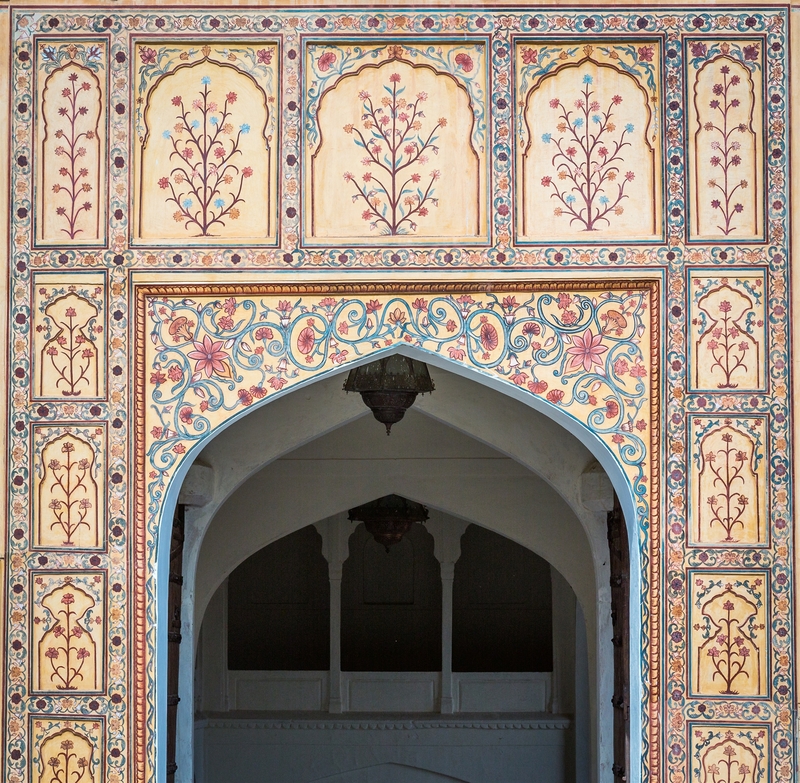 Look out for some old surviving frescoes on the outside walls that are protected from the monsoon rains and fierce sun.